Mountain Top Chalet is a spacious cabin, located on a private road along the top of the mountain, at the edge of the George Washington National Forest. Cabin has 3 bedrooms and 2 baths and fully equipped kitchen. Also within walking distance to Kennedy's Peak hiking trail. 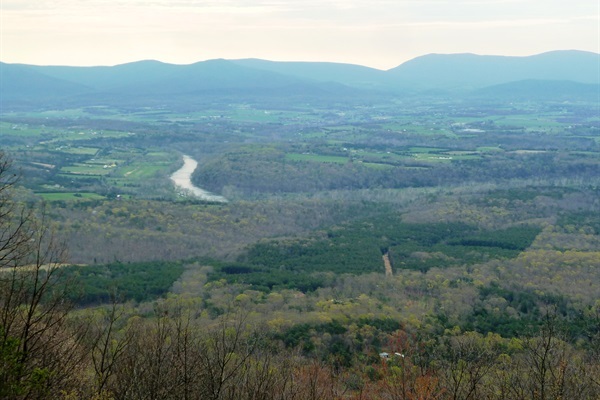 Cabin has a glass sun room and deck with incredible views of the Shenandoah valley and bends of the Shenandoah River. This pet friendly cabin has a fenced in yard and "L" shape gated deck. During inclement weather such as snow or ice you will need to have 4 wheel drive or tire chains. We also recommend Travel Insurance during winter months. We do not give refunds for road conditions that are out of our control. Lake Arrowhead and much more. Enjoy nearby activities including fishing, hiking, biking, horseback riding, golf, canoeing, kayaking, tubing, antique shopping, wildlife observation, restaurants, summer swimming and winter skiing. Come and enjoy the great outdoors.